It’s important to understand how unlikely this victory is. Six months ago, almost no one outside the pipeline route even knew about Keystone. One month ago, a poll of “energy insiders” by National Journal found that “virtually all” expected easy approval of the pipeline by year’s end. As late as last week, CBC reported that TransCanada was moving huge quantities of pipe across the border and seizing land by eminent domain, certain that its permit would be granted. A done deal has come spectacularly undone. “How long will those customers wait for Canadian crude oil to get to the marketplace before they sort of throw up their hands and say this is just never going to happen?” he asked. On the less hopeful side of things, McKibben mentioned the possibility that Obama made the announcement because he merely “wanted us off the streets — and off his front lawn — until after the election, at which point the administration can approve the pipeline, alienating its supporters without electoral consequence.” While that may have been a factor, McKibben doesn’t seem to think it should matter. The president should know that if this pipeline proposal somehow reemerges from the review process, we will use every tool at our disposal to keep it from ever being built; if there’s a lesson of the last few months, both in our work and in the Occupy encampments around the world, it’s that sometimes we have to put our bodies on the line. We need to let the president and oil companies know that we’re ready to take action should they try to push this pipeline through in a couple of years. There’s a pledge to take nonviolent action against the pipeline up on the Tar Sands Action site; if you sign it, you’ll be the first to know about anything we need to do down the road. It’s also important to note that TransCanada doesn’t have all its eggs in one basket. They are looking to build pipelines west from the tar sands to Canada’s Pacific coastline. Canadians, led in large part by indigenous peoples, are fighting to stop this and are in need of support. At the same time, there are other battles on the climate front, including mountaintop-removal coal mining, deep-sea oil drilling, and fracking for gas and oil. None of these can be ignored, especially — as the International Energy Agency put it in new study — with the point of no return approaching in just five years. Were such news to be announced any other time than on the heels of this Tar Sands victory or the growing Occupy Wall Street movement, it might be reason to give in to despair. But now, let’s hope it’s a clarion call. 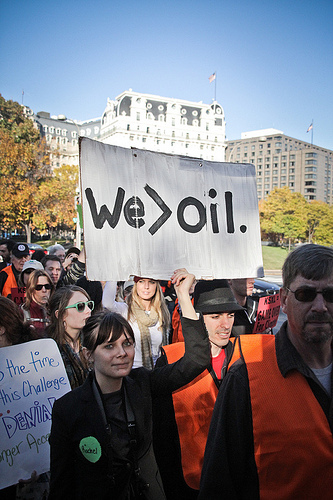 The anti-Keystone movement originally focused its message on climate change. The argument was simple: increased greenhouse gas emissions from Alberta’s oil sands would be devastating for the planet. But that message was not enough. So campaigners joined forces with an unusual set of allies: Nebraska landowners and politicians, many of them pro-oil Republicans, who simply did not want a pipeline running through their backyards. That approach appears to have paid off. The State Department has justified its new delay in deciding on the pipeline application by announcing that it will be conducting an assessment of alternative pipeline routes. That rationale speaks squarely to the local Nebraska opposition, and says nothing about the climate concerns. For green groups, the shortest route to blocking fossil fuel development appears to be leveraging local opposition. Many will seek to turn this not only against the Canadian oil sands but against United States oil production and coal exports, too. At the same time, they will find themselves increasingly appealing to the federal government for help in overriding local opposition to wind farms, solar plants, long distance transmission lines and other critical pieces of zero-carbon infrastructure. These two endeavors will conflict.